DETROIT -- Bentley today was set to unveil a Speed version of its Continental GTC convertible at the Detroit auto show in a continued effort to attract younger buyers to the luxury brand. Like the GT Speed coupe and the four-door Continental Flying Spur Speed before it, the GTC Speed has a turbocharged W12 engine that delivers 600 hp and about 536 pounds-feet of torque. 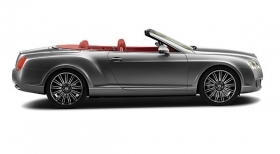 The top speed of 195 mph with the roof down makes it the fastest Bentley convertible ever. Since the GT Speed coupe debuted in 2007, it has become the top-selling GT model worldwide. Bentley expects the GTC Speed to account for up to two-thirds of GTC sales in its first year of production. The GTC Speed goes on sale this summer as a 2010 model. Bentley also refreshed the standard GTC this year, giving it low-friction dampers for improved ride comfort. Both GTC models get a more upright radiator grille with a more pronounced square edge and a lower air intake. Two new options are available on both GTC models: carbon-ceramic brakes and a follow-to-stop adaptive cruise control system that uses a long-range radar sensor to monitor traffic ahead.